A MOO Branding and Graphic Design Project. Monash University is a premium and respected brand. As such, as their brand evolves, strict guidelines governing creative brand execution and graphic design standards are developed for use by the agencies that support the various faculties in the university. 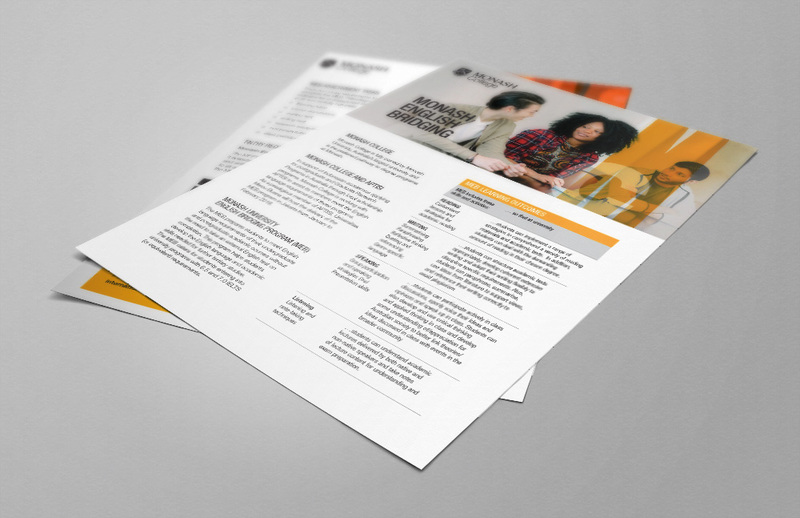 MOO Marketing and Design has had a long relationship with a number of areas within Monash including Monash College and as each iteration of their brand occurs, we have been able to follow new brand guidelines and generate creative graphic design for print and digital marketing collateral. Recent marketing collateral designed by MOO has included, brochures, flyers and graphics for a number of external marketing campaigns. In addition MOO have applied our graphic design and brand execution skills to generate a number of internal documents, forms and templates for use by internal staff in their day to day work. Whilst Monash University are the architects of the brand, MOO has been able to work with the outcomes of their internal creative and branding and subsequent style guide to reinforce and strengthen the brand. We are true custodians of all the brands we represent and have the experience, understanding and know-how to take pre-existing brands and implement them to a very high standard. Our graphic design team is one of the most respected in Melbourne. So, if you’re looking for a new brand, brand refresh or the implementation of creative graphic design solutions for an existing brand contact us. Large or small, we’d love to hear from you.